In this post I explore a key element of web marketing, SEO, sales conversions and social follower acquisition. I look at a very simple idea which can lead to huge traffic and conversion gains. The internet is built around convenience. We use it to make our lives easy. You go online for a reason. Google are top dog on the block because people come to the web with a goal. They want to do something and Google is often the quickest most accurate way of achieving their goal. Google is #1 for daily website traffic on the whole internet. So content can’t truly be king because Google is on the throne. Google, the search engine, which gets all this traffic is very content lacking (in its own right). On Google when people choose a website from the search results page they are trying to work out which result will be “best” for them”. Google is a very convenient search engine and the internet loves convenience. What is VERY important is continuing that convenience when the user reaches your website. Your user is expecting your site to be the best result for their query. If you want a lasting relationship with your user group your website must easily allow them to achieve their goals. In 2016 people take convenience over quality you can leverage that. Give them both and you will rule your niche. People expect. People expect at the click of the button. They want you to help them achieve their goal in seconds. 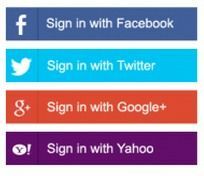 Social login platforms are truly amazing creatures. They allow signup processes that used to take MINUTES to be achieved in one button click. They drastically increase sign up rates and improve each user’s experience by saving time and simplifying their journey. The same is true with social sharing. If you don’t make sharing as easy as it can be for your user they won’t do it. Sadly, in this age of conveniences a user is very unlikely to tweet “just read this great article that didn’t have any social sharing buttons here you are guys read it yourselves”. You see this in call to actions. They use a very basic psychology. Call to actions are very much about if you don’t ask you won’t get. You want a user to make an action? Your user is at best indifferent to this action because it is inconvenient. They may not even have thought of it. You are taking a small amount of their precious time. If you don’t ask your user will never surrender their time and (for example) subscribe to your email list. This should always be done in one step otherwise your user may change their mind. The same should be true with any action you want a user to take. If subscription, payment or even navigation can be done with one button click you will be king of your niche. Look at my sharing bar, it floats on the left hand side unobstructedly but always there for you to share this in one click whenever the feeling may take you. Email collection is also vital to get right. If you run an inconvenient website you will notice fewer interactions, less signups, sales and less of a social community around your website. Who thinks “wonderful, a 3 step login with multiple complex captchas”? Convenience is the secret to conversion rate optimisation. Google are now so influential they are able to make the whole web more convenient. With their latest release if your site isn’t mobile friendly – responsive, with an easy layout – your rankings will be damaged. In the past Google’s updates have largely been to make the results as relevant as possible. Now that you can rely on Google to return a relevant result we are seeing a trend towards making their results more interactive and engageable. The future as I see it is a rise of voice search from mobiles, specially in the winter – it’s just easier. This is why Google is implementing these changes now, after a study they did a year ago on how people use voice search. Just having a smartphone changes how people interact with your website. Voice search optimisation (VSO) will become very big very soon. There is so much more to it – the benefits of user experience are huge and far reaching. If your users really feel that your website gave them outstanding service they will give back to you. Users will become your audience and follow what you do through social media. You will receive more personal recommendations. If you are really lucky and went out of your way giving help, users may write you reviews, or link to your website. These are some of the strongest off page SEO ranking factors. With just a bit of planning and some tweaks to your website massive improvements can be made. On the internet we have reached an age when convenience is king – there’s just so damn much content. I will say it again convenience is king – boost sales, social engagement and SEO by speeding your users on their path and giving them a great experience. If you are looking for advice on how you can improve your user journey and make your site more engageable I have an in depth guide on just that. Enjoy!